What is another word for Pertaining? reports, issues, Measures, Standards, Goals, Respecting, pertinent. 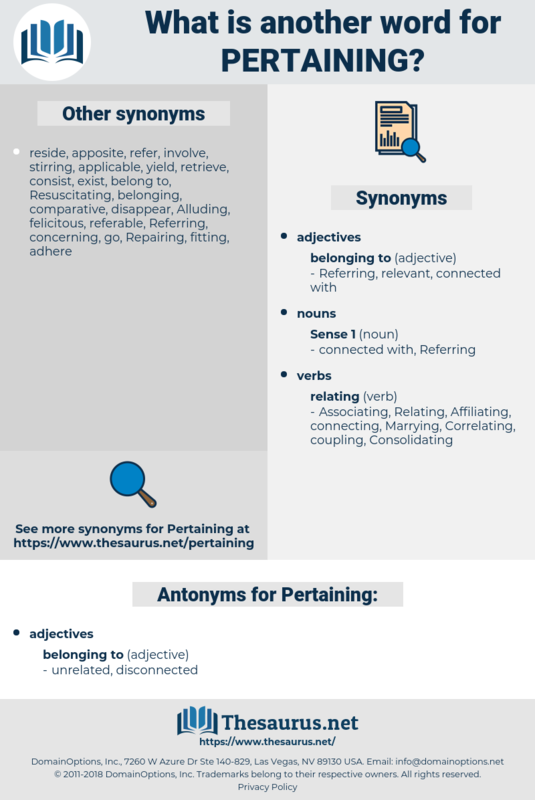 Explaining, Indicating, Originating, participating, Containing, correspond, Stipulating, representing, Underpinning, Administering, existing, Guaranteeing, Promulgating, specific, Designating, Comprising, complementary, investigating, Constituting, interesting, targeting, cooperation, Consisting, Generating, issuing, Activities, Afflicting, Emanating, encircling, Purporting, impeding, Including, Testifying, Cooperating, lnteresting, approving, Infecting, Specifying, identifying, Describing, Accruing, Responding, increasing, reflecting, Expressing, directing, Prescribing, ranging, Impacting, Depending, Introducing, determining, Envisaged, comparing, restricting, pointing, tending, Alleging, underlying, highlighting, Enacting, Treating, distinguishing, supporting, exciting, allocating, Amending, response, handling, Influencing, answering, Outlining, featuring, accompanying, defining, Noting, Examining, Embodying, enclosing, Granting, Depriving, tackling, Recognizing, entering, connecting, Instituting, attending, reigning, prevailing, Enforcing, benefiting, deriving, Experiencing, arriving, enrolled, Requiring, Commenting, confronting, imposing, detailing, measuring, Elaborating, embracing, Enjoying, underlining, Noticing, revealing, engaging, appealing, Aiming, Adopting, special, stressing, owing, honouring, Extending, rising, Formulating, Earning, Areas, ruling, challenging, Providing, Displaying, giving, proceeding, Possessing, Channelling, concluding, resulting, listing, Occupying, typing, Charging, Receiving, Attempting, Declaring, Having, Employing, Spanning, binding, Stemming, using, raising, guiding, reaching, Plaguing, balancing, bringing, collecting, ensuing, shaping, promising, hitting, Occurring, suffering, Linking, processing, reviewing, Discussing, causing, force, being, Effecting, observing, framework, Establishing, focusing, driving, leading, marking, controlling, Requesting, knowing, setting, services, Stating, asking, Lifting, fostering, facing, Besetting, paying, drawing, lodging, wording, Harboring, Carrying, bordering, shifting, Claiming, according, Milking, serving, laying, recovering, heading, showing, coming, plan, planned, cases, seeking, awarding, talking, Levied, approaching, holding, mounting, keeping, trying, backing, calling, Forming, acting, looking, founding, Doing, 4.10, making, bearing, regarding, corresponding, Respecting. enforceable, point, grant, membranebound, execute, involve, cover. concerning, bearing, regarding, relevant, relation. 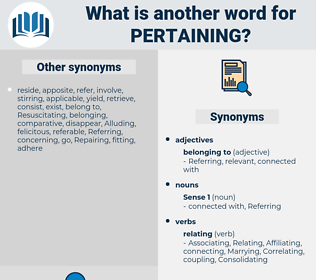 Incorporating, Concentrating, implementing, Imputing, Attesting, Acknowledging, Referring, Applying, questions, Devoting, Attaching, wearing, pursuing, falling, concerning, relevant, Relating. relate, refer, apply, address, relevant, deal, arise. The Chinese nursery is well provided with rhymes pertaining to certain portions of the body. The young man's plans and prospects in life had all been sacrificed to the service of Franklin as his secretary, which was in fact the service of the country; yet he had never been able to collect even the ordinary salary pertaining to such a position. parthian, pyrrhotine, pure tone, peroration, peritoneum, parttime, preteen, per diem, pare down, proudhon, pyridium, perdition, pyridine, partition, predation, peridium, proteome, proration, protean, proton, preordain, puritan, portion, protein, protamine, paper thin, pardon, port wine, peridinium, party man, protium, part name, pro tem, protoheme, pertainym, parthenon, pour down, peridinian, parathion, part-time, protohemin, parthenium.